You are currently browsing the Athletic Tape Info Center blog archives for August, 2009. 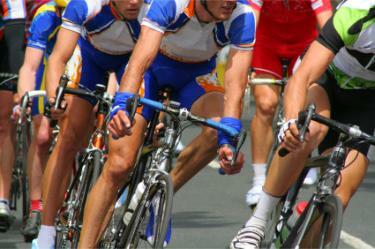 Long distance competitive cycling is a one of the most grueling endurance sports in existence. Hour after hour of pedaling up and down some of the most mountainous terrain in the world takes a huge toll on the knees, thigh muscles and calf muscles as they scream for relief. In addition, the forward leaning posture of cycling creates long-term stress and strain on the muscles of the neck and back. With many races conducted over days (or even weeks), there is virtually no time for overused, fatigued joints and muscles to properly recover. 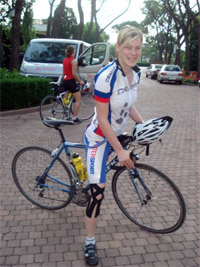 Cyclists are always looking for ways to accelerate their bodys’ recovery – both from intense exertion and from injuries. Recently, more and more racers have been turning to a unique and effective tool that helps in both of these areas. This exciting new discovery is kinesiology tape, the very thin, very lightweight, very stretchy, colored tape that has been seen on numerous athletes since coming to prominence in the Beijing Olympics. Applied over a fatigued muscle, kinesiology tape accelerates the recovery process by increasing blood flow and removal of waste products. Applied to an injured joint, it can prevent harmful movement while still allowing a safe range of motion. This is a huge benefit to professional athletes who prefer to continue training and/or competing through minor injuries. One team that has benefitted greatly from kinesiology taping is Team Planet Energy, Canada’s top professional cycling team. Team Planet Energy uses SpiderTech Pre-Cut Kinesiology Tape on a regular basis, for both training and competing. One of the most exciting developments in the area of pain relief is kinesiology tape – a new type of therapeutic tape that possesses virtually the same thickness and elasticity as human skin. Because of these qualities, once it is applied there is very little sensation associated with wearing it, making it exceptionally comfortable compared to other types of tape. Another factor that makes kinesiology tape unique is that it actually provides significant therapeutic benefits, as opposed to simply providing support and limiting movement. The most dramatic effects noticed by most users are a rapid relief of pain, accompanied by a reduction of swelling and inflammation. This post is going to focus on how kinesiology tape relieves pain. Acute pain is caused by a recent trauma or injury. Post-surgical pain is also a type of acute pain. The most effective technique for pain relief is to hold the injured muscle in a stretched position while the kinesiology tape is applied. When the taping has been completed, the skin will appear slightly puckered as the tape gently lifts it. This lifting action creates a space between the skin and the inflammed tissues below. reducing pressure on the blood vessels, lymphatic vessels and nerve endings in the injured area. Improved blood flow enhances delivery of oxygen and nutrients to the injured tissues, accelerating the healing process. Improved lymphatic flow reduces swelling which relieves pressure on the pain receptors providing rapid pain relief. Chronic (ongoing or long term) pain often results when the neuromechanisms responsible for sending pain signals to the brain stop working properly. Like a switch stuck in the “on” position, they brain forgets to turn the pain signals off, even after the trauma has been resolved. This pain is abnormal because it is out of proportion to the severity of the injury. At this point, it becomes detrimental, as it has far-reaching effects on both muscle function and quality of life. A simple application of kinesiology tape helps relieve chronic pain in several ways. The sensation of the tape on the skin stimulates several types of pain receptors, including some called merkel cells. After the tape is applied these cells begin to notice the minute sensations coming from the tape, and begin to tune into them. In simplified terms, the stimulation provided by the kinesiology tape interrupts, then overrides the pain signals going to the brain, effectively breaking the abnormal pain cycle. Because a single kinesiology tape application is worn continuously for 3-5 days, the pain relief benefits can accrue over this entire period of time. Kinesiology tape is truly a breakthrough in non-pharmaceutical management of both acute and chronic pain. Athletes are a unique breed. They take a lickin’ but want to keep on kickin’ … or running … or jumping … or whatever other activities are involved in the pursuit of their sports. Deciding whether to train through an athletic injury is one of those “six of one, half dozen of the other” propositions. If an athlete stops training and competing while an injury heals, they will face the loss of conditioning, technique and competitive edge that accompanies inactivity. And, of course, for many professional athletes, they also face a loss of income while they recover! On the reverse side, an athlete who chooses to continue training and competing while injured faces the possibility of exacerbating the injury – or, sometimes, developing additional injuries in muscles and joints that overcompensate for the injured area. Sports tape has always been a mainstay in the toolkit of every athletic trainer. It has been used for decades to support and/or immobilize injured areas so athletes can continue their sport while injured. The downside of traditional athletic tape, however, is that it DOES virtually immobilize the taped part of the body. This may lead to poor technique that can affect performance, as well as contribute to injuries due to inefficient movement patterns. One of the most exciting new tools used by athletic trainers today is kinesiology tape. Kinesiology tape for sports injuries is a dream come true for both the trainer and the injured athlete. On the trainer’s side, a single application can be worn 3-5 days, providing therapeutic benefits round-the-clock. It enhances and prolongs the benefits of any other type of therapy used, and because it literally goes home with the athlete, the trainer can relax, knowing his work is continuing in his/her absence. From the athlete’s perspective, kinesiology taping applications are lightweight and stretchy, making them totally comfortable to wear. The acrylic adhesive is non-allergenic, preventing the tape rashes and burns that are common with other types of sports tape. In addition, the combination of the breathable 100% cotton tape and the wave pattern of the adhesive backing make kinesiology tape extremely water resistant. Athletes can sweat, swim or shower without worrying about having to remove and reapply their tape – or having it come off in the water. The biggest advantages, however, are the physical benefits of kinesiology taping – rapid relief of pain and swelling, support of injured muscles with no restriction of range of movement, and enhanced activation of muscles. 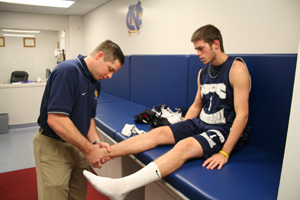 A dream come true for both athletic trainers and injured athletes! This is the 4th installment in my series on kinesiology taping for tennis elbow or lateral epicondylitis. I’m now focusing on specific applications for individuals who need to continue their activity despite having an ongoing tennis elbow problem – chronic elbow pain. This technique is also applicable to those returning to activity following a period of rest and/or physical therapy for tennis elbow. The following step-by-step instructions are for application of a pre-cut kinesiology tape specifically for the elbow. 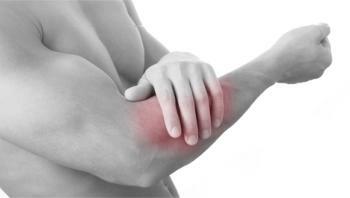 Ensure that the skin of the elbow and forearm is clean and dry. Prepare the precut elbow kinesiology tape by tearing the backing along each of the perforated lines. This will allow you to apply each section individually, creating a more effective application. Step 1. Remove the backing from section 1 (the anchor) and apply with no stretch in the tape to the outside of the arm just above the lateral epicondyle (bony bump on the outside of the elbow). Gently rub tape from the center out to activate adhesive. Step 2. Remove the backing from both sections 2 and apply both sides to the skin with no stretch in the tape. Gently rub the tape from the center toward the ends to activate the adhesive. Step 3. Remove the backing of section 3 and stretch the tape approximately 1″ longer than resting length so that the hole is directly over the lateral epicondyle (bony bump on the outside of the elbow). Rub to activate adhesive. Step 4. Flex the wrist, pointing fingers downward. Begin removing backing from the outside arm of section 4, applying the tape in the direction of the little finger with no additional stretch in the tape. If the tape is applied to the skin as the backing is removed, you will create the ideal tension. Step 5. Keeping the wrist flexed and the fingers pointed downward, begin peeling the backing from the inside arm of section 4, applying the tape in the direction of the thumb. If the tape is applied to the skin as the backing is removed, you will create the perfect tension. Final View. Be sure to gently rub over the entire taped area to activate the glue. For best results, apply tape 30-60 minutes before sweating, swimming or showering. 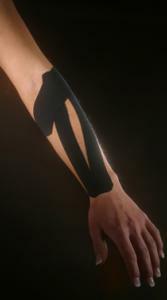 A complete list of tips for applying and removing kinesiology tape can be found at www.theratape.com/application/tips. My next post will include a video showing the above elbow taping being performed by a trained chiropractor. This is the third installment in my tennis elbow series. 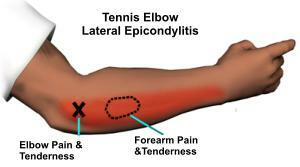 Part 1 provided an overview of tennis elbow, or lateral epicondylitis. Part 2 provided kinesiology taping instructions for acute tennis elbow during a break from activity, with the goal of relieving inflammation and helping the overused wrist extensor muscles relax and recover. Many people with tennis elbow, however, can’t or don’t want to take time away from the activity that is responsible for the pain and inflammation. Many athletes prefer to “play through” overuse injuries like tendonitis of the elbow, while manual laborers with lateral epicondylitis may need to continue working to earn a living. In these cases, a different kinesiology taping technique can be used to reduce pain and provide structural support for the muscles of the forearm.This technique is also applicable to individuals returning to activity after taking time off due to tennis elbow pain. 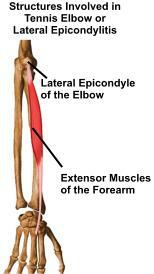 Taping from the origin (elbow end) to the insertion (wrist end) of the forearm extensors will facilitate activation of these muscles, overiding the body’s natural decrease in muscle tone and muscle activation that occur in response to pain. The following step-by-step instructions are for using pre-cut kinesiology tape for tennis elbow. The brand name of this product is SpiderTech, and the elbow application is one of 15 different precut kinesiology tape applications for different parts of the body. 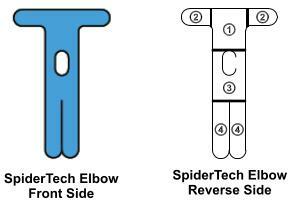 The following images show the shape of the pre-cut SpiderTech Elbow application, followed by a diagram of the reverse side showing the application sequence. My next posting, “Kinesiology Taping for Chronic Tennis Elbow – Part B” will provide step-by-step application instructions for the SpiderTech Pre-Cut Elbow Tape.